Welcome to Paramount Home Collections &quot;Manufacture & Exporter of Interior Decorative Items & Corporate Gifts&quot;We are an ISO 9001:2008 certified company, established in the year 2008. Our commitment to quality & client satisfaction helped us to gain global client base. Timeliness, Competitive prices, advanced technology & High-tech infrastructure are some of the key attributes of our organization. We are engaged in offering Hurricane Candle Lamps, Tea Pots, Cake Stands, Christmas Decorations & Wall Scones. 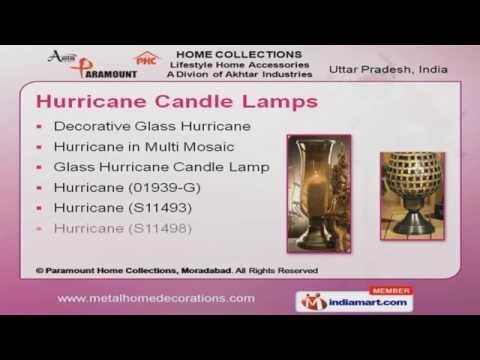 Our Hurricane Candle Lamps are well known in the market for their outstanding features. Tea Pot Copper Antique & Designer Cake Stands are some of our best selling products. We are specialized in offering Decorative Items & Votive. Our Christmas Decorations & Wall Scones are fabricated of from premium grade raw materials. Along with that we offer Food Platters & Household Trays that are a class apart.